And so we find ourselves some time later…twenty and counting, wondering what has happened to Neil Carter! Some days I find myself asking the same thing. My departure from the world of rock was quite uneventful as it happens. Gary as we know went off to record ‘Still got the Blues’ and part of me thought he would say at some point ‘let’s make another album’ and part of me hoped he wouldn’t! I think by the time of ‘After the War’ the thrill had gone for me and although the 90 minutes on stage was always a buzz, I found the rest of it a pain. I had met my current partner by then and wanted a simple life of domesticity but I also felt I had said all I could in the Rock world. My endless touring with UFO had taken its toll and enthusiasm levels were low. So I took a year off and at just 30 had absolutely no idea what I was going to do next. Money was not an issue so I coasted, doing a few bits and pieces, some of my own demos, work with a guitar prodigy of Peter Grant’s and I also took over as musical director of a West End show for a while (which was worse than death). Oh, and I also started giving a few lessons on the piano and clarinet to busy myself. Ooops! In the same way I became all enveloped by the idea of becoming a rock musician, I really started to enjoy playing classical music again and me being me went madly back to basics and got my qualifications and then began teaching in earnest. Funnily enough not once did I miss being on stage and doing what I had done for over 13 years before. Strange. 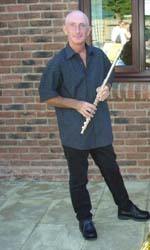 At this time I am Head of Woodwind and Brass at Brighton College which is a co-educational independent School in Brighton where I have lived since 1980. 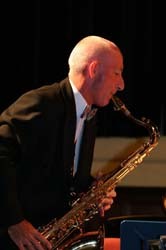 I have 50 plus clarinet and saxophone pupils and also conduct the large Concert Band and Swing Band there. In 2003 I also became an examiner for the Associated Board of the Royal Schools of Music (ABRSM), something I would have never dreamed possible and am immensely proud to have been accepted. This involves examining practical music exams in all disciplines including jazz. Given my background the interview was quite interesting! They are a fantastic and ‘august’ body with amazing international connections, so there are opportunities to examine all over the world. I sometimes sit at seminars wondering how I got ‘here’ though! I have some contact with Gary Moore, Bob Daisley and Paul Chapman and occasionally the subject comes up of ‘coming back’, something I find hard to imagine, although I would have not missed any of it for the world. And, bizarrely it never quite seems to go away with ‘Best Of’ compilations, re-releases and the happy plop through my letter box of the twice yearly royalty statements. Not quite as large a ‘plop’ now but still trickling in...and what has astonished me is the way this site has been received by people who hold a special place for that era. I am constantly amazed how all my contemporaries carry on performing so the music continues to thrive. I have also been asked to do a number of ‘E’ interviews and that has been a great way of recounting some good (and bad) memories.